From the moment we all started meeting each other something special happened. The journey started on a beautiful spring day in May. We met our team honored hero Kate, our coach, staff, teammates, and mentors. We snapped our first team picture and we were off. October seemed so far away. Five months away to be exact. Who knew what we were in store for. We ran, a lot, we laughed, and shared, sometimes a little too much… We became a family. We rallied around teammates who had surgery for cancer, and those who lost to cancer. We learned what to eat (carbs are your friend), proper form, breathing, how to prevent injuries, that shoes are important, and “cotton is rotten!” And since it was summer in Atlanta we sweated. Boy did we ever sweat! Our fabulous co-captains looked out for us with fun raffles, bagel crack, I mean bagel chips (I highly recommend the cinnamon sugar ones, although the plain ones are pretty darn tasty too! ), and post run tailgates. One teammate convinced us all that we loved bacon, and another hung around until everyone returned with a smile, a hug, and a big hell yeah. Before we knew it we were running our last long run of 20 or 12 miles. It was an adventure with three different courses right after the great flood. And then October arrived. “The hay is in the barn,” we were told. “Don’t do anything new on race day.” It was time to decorate our fabulous TNT singlets, and pack our team shirts. With the help of our fabulous staff coordinator we all made it on the plane. We were little balls of energy the whole plane ride. No one sat through the whole flight. There were plans for In and Out burgers, sight seeing, trips to the expo to pick up our race packets, and so much more. Oh, and there was a race for us to run too. A race with amazing views of the bay, piers that smelled of sourdough bread as we ran past, ocean views, and a park that smelled like eucalyptus. We went over the hills of San Francisco, down a cliff, along the great highway, and around a lake. And at the end of it all were firemen in tuxedos holding silver platters stacked with little blue boxes! In the end it wasn’t just a race. It was a chance to do something great for others while doing something I love. And along the road I discovered my new “family.” So here’s to a great five months full of friends, fun, bacon, bagel crack, and a whole bunch of Hell Yeah. Can’t wait for the next one! 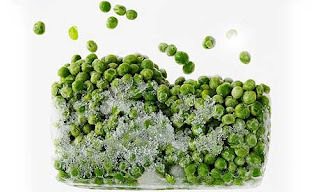 I love frozen peas. When I was a kid, I used to ask my mom if I could just eat them that way. She’d cook the heck out of them, and I couldn’t stand their consistency. My sister and I would have contests at dinner to see who could hide more of her peas. She’d mix them in to her mashed potatoes. I’d take a mouthful of peas, then a gulp of milk….and then I’d spit all the peas into my milk glass (we must have drank whole milk, because you couldn’t see the peas through the milk). I’d win. In high school, I had what was known as a ‘Zero Period’ class. It met from 6:55 am to 7:45 am. And it was Calculus (we had some mean administrators, let me tell you). Anyhow, being a teenager, I never woke up in time to have breakfast before going to Zero Period. I’d roll out of bed at the last possible second and race to the school in my ’69 Camaro Berlinetta (thanks, dad! ), all the while wondering if I’d done my homework on derivatives correctly. I’d plop down in class with my travel mug of coffee and my Ziploc bag filled with….you guessed it….frozen peas. People would look at me funny (including the teacher), but I didn’t care. Frozen peas are brain food, I tell ya! Last Wednesday, I was in a minor fender bender. Don’t get concerned…I’m fine! I was driving on a two lane road, and a woman was making a right turn out of a parking lot onto the road. She made one hell of a wide right turn. Right into my driver side rear bumper!!! It jarred my car hard enough that I shouted a few choice expletives before stopping the car to inspect the damage. I pulled over, set my e-brake, and got out of the car. Here’s the kicker…the woman who hit me kept driving!!! I was (LIVID, FURIOUS, INCREDULOUS) quite upset by this behavior, and in the most adult manner possible, I stomped around my car, flailing my arms wildly in an attempt to get noticed by her so that she would stop. Am I okay. Am I okay? (LIVID. FURIOUS. INCREDULOUS. She was going to just drive away. She was going to HIT someone and just drive away!) Am I okay? As best I could tell, physically, I was a little shaken up, maybe somewhat jarred. Emotionally, my very short-temper was about to burst into flames. Knowing that restraint is not my strong suit, I SHOUTED back, “Thanks for asking.” (The Italics are used to emphasize the not-so-nice-ness of my tone.) At that point, I stomped back into my car and drove away. I was afraid that if I stayed there one second longer, I might have punched her. Sometimes, you just have to let things simmer, and they turn out awesome. This was one of those weeks. I’ve been struggling on sticking to the Team in Training schedule. I just came off running a great half marathon. I feel strong. I feel fast. Sticking to the low mileage at the beginning of the ING training has been hard. 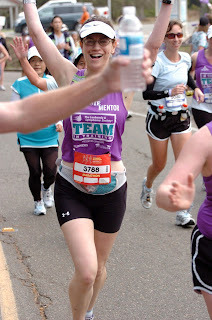 Our coach, Barb Stinson, sent out an e-mail warning against pushing too hard: “Just because you CAN, doesn’t mean you SHOULD.” I have a clear running goal: finish the ING Georgia marathon in under four hours (the bigger goal: raise money to help find a cure). I’ve tried (and failed) in the past to run a sub-four marathon. I tried it my way, it didn’t work. Now, I’m trying it this way. And this week, something just clicked. I’m feeling so good on my runs, so strong. I know things will get a lot harder, but I have a good feeling I’ve hit my stride for training (and found some great TNT runners at my pace to keep me company!). I’m using my new motto “Running is like soup” to keep me on track (thanks, Barb for these tips)! $1 Billion for Charity! Endurance athletes cross major fundraising milestone! Great news today from The Leukemia & Lymphoma Society's home office in White Plains, NY!! Team In Training (TNT), The Leukemia & Lymphoma Society’s (LLS) groundbreaking charity sports training program, has reached a remarkable milestone of raising $1 billion to support blood cancer research and patient services. For more than 21 years, TNT has been the pre-eminent charity endurance sports training program, preparing amateurs and seasoned athletes to complete a marathon, half marathon, triathlon, 100-mile century cycle ride or hike adventure. Through the program’s expert coaching and support, more than 420,000 people have experienced the exhilaration of embracing and achieving a major athletic feat. The enormous success of TNT has made possible advances in blood cancer research, helping to find better therapies and treatments that have prolonged and enhanced the lives of hundreds of thousands of patients. 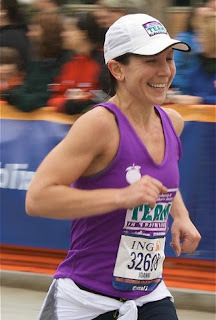 TNT began in 1988, when Bruce Cleland, a Westchester County, NY, businessman, spurred on a group of 38 to train for the New York City Marathon while they raised money for leukemia research in response to his own young daughter’s diagnosis with the disease. Cleland enlisted friend and Olympian Rod Dixon to train them. That first team raised $320,000 for LLS; and so a movement was born. The idea quickly began to catch on with other chapters, and during the 1990s, walk, cycle and triathlon were added to the mix. Spectators at the events quickly began to recognize the signature purple jersey worn proudly by TNT participants. The advent of online fundraising has also helped the program grow. TNT continues to provide high caliber training by certified coaches and participants have the camaraderie of a group of supportive teammates while they train. In addition to weekly training sessions TNT offers clinics on nutrition, equipment, injury prevention and safety. Among the more than 200 national and local events TNT participants can attend, the program has increasingly been adding more co-branded events to its roster, including The Nike Women’s Marathon to Benefit The Leukemia & Lymphoma Society; the Nation’s Triathlon to Benefit The Leukemia & Lymphoma Society; the Women’s Running Magazine Women’s Half Marathon and 5K to Benefit The Leukemia & Lymphoma Society, and Rock ‘n’ Roll San Diego Marathon & ½ to Benefit The Leukemia & Lymphoma Society. TNT is currently recruiting for its summer season, which includes the and Rock ‘n’ Roll San Diego Marathon & ½ to Benefit The Leukemia & Lymphoma Society, America’s Most Beautiful Bike Ride in Lake Tahoe and the Mayor’s Marathon in Anchorage, AK. To learn more visit www.teamintraining.org or call 1.800.482-TEAM. All the Single Ladies (all the Single Ladies)! Put your hands up! Lord knows there are lots of us single ladies in the Team In Training program. And as we spend time at the beginning of each season talking about training, I thought it would be apropos to spend some time relating the principles of training to the world of dating. Dating Etiquette/Safety: When preparing to go on a date, make sure you have both the rules of etiquette and safety under control. For instance, just like when you go running, don’t wear headphones on your date. You want to be attentive to what is happening on the date. That’s hard to do if you’re rocking out to some TSwift or Party in the USA. Also, make sure you have a safety plan. Akin to the TNT Hotline, make sure you have your own dating hotline. Call a girlfriend to let her know where you’re going, who you’re meeting and what time you plan to return home. Tell her you’ll call or text her when you get there, so that she knows your safe. Stretching: Just like on your training runs, it’s a good idea to stretch before a date. You want to be relaxed and ready to enjoy your entertaining evening. Dating Specifics: The purpose of dating is to find a person with whom you may want to spend extensive time with. In order to do that, you need to follow a dating schedule. This is not as specific as your TNT training schedule…in fact, it’s slightly more challenging. You have to GET OUT THERE. Make sure you are scheduling dates at least twice a week. Do not be concerned with how long each date lasts…it’s not the length of the date that matters, it’s the quality. On your date, you want to keep your heart rate at 60-70% of its maximum. (Interpret that as you wish…ahem.) Remember to dress appropriately. You must be careful to neither under-dress nor over-dress. Don’t forget to keep your toe nails trimmed. And remember, your REST day is as important as your Date Nights. Nutrition: Nothing new on Date Night! Do NOT try food you haven’t tried before…what if it doesn’t sit well in your stomach? You certainly don’t want intestinal upset to interrupt your magical encounter. You should eat a good, full meal. Don’t pretend that you aren’t hungry in front of a new man. We run as much as we do so we can EAT. Do it! Injuries: So you went on a FANTASTIC date, and he hasn’t called. What do you do? When it comes to potential injuries (including heartbreak), remember that LESS IS MORE. You can seek the advice of your injury support team (read: other TNT girlfriends). They will provide you with endless support, a good venting run and probably some Ellwood’s after. Do you watch that new TV show Glee? It’s right up my alley. Dorky kids, the outcasts of the high school, singing their hearts out under the direction of one VERY hot teacher. Sounds like my high school experience…minus the hot teacher, that is. I was in the high school choir, the girls’ barbershop quartet and the National Honor Society. I never hung with the popular kids, unless they wanted help with their homework or something. I was valedictorian of my high school, aka Nerd Extraordinaire. I know some of you out there are saying, “Well, Jo, not much has changed.” And I guess some of you are right. I am still a dork. But the difference is that now, as an adult, I don’t care what other people think like I did when I was in high school. And I owe that attitude to Team In Training. When I started with Team In Training, I lacked self-confidence…and I was terrified of the possibility of failing. But after the first few weeks, I realized I had nothing of which to be scared. The people involved in the community of Team In Training exude hospitality. I was SO excited about the possibility of not only becoming an athlete, but also of becoming a good athlete, that I almost immediately starting asking about how I could become faster, better, stronger. My coach and team mentors just smiled and nodded: I had caught the bug. But the bug wasn’t necessarily about being an athlete. It was about being accepted. And I was. That’s one of the reasons I love Team In Training so much: everybody fits. Sure, I’m still a dork. But I’m happy to be a dork if it means finding a cure for cancer.